Share the post "Dakota Dogs — Prairie Dog Hunt with Dan Eigen in South Dakota"
With a heavy mind and heart we regret to inform you that we will not be hosting the 2011 Annual Jamboree. Some of you may already know and some might not have yet heard; the communities of Pierre and Fort Pierre are currently undergoing a flood. Each city has a levee system running parallel to the Missouri River, with some even running through the middle of town. Water currently being released from Lake Oahe is at 150,000 cubic feet per second. It is projected to stay at that level through mid August. To make it easier to visualize… if you were eating supper at the Pizza Ranch and looking out the window, if the levee was not there, all you would see is water. It is that high. As in years past our policy has been Jamboree registrations are non-refundable. Due to the current circumstances, which we have no control over, all participants who have already signed up for Jamboree 2011 will be given credit for Jamboree 2012. Credit is for Jamboree use only and cannot be transferred to another event or applied towards membership dues. Thanks again for your continued support throughout the years. Plans are already being made for Jamboree 2012. Jeff Rheborg, CEO, Varmint Hunters Assn. Story tip by EdLongrange. We welcome submissions from readers. Share the post "VHA Cancels Annual Jamboree Due to Missouri River Flooding"
Black Hills Ammunition has released a video showing the production process at Black Hills’ ammo plant in Rapid City, South Dakota. As you’d expect there is footage showing the assembly-line, with massive machines churning out loaded cases (look for the bullet seating machine). But this video has a second, softer side — it also focuses on the human factor at the Black Hills facility. Black Hills President Jeff Hoffman narrates the video, which profiles some of the key production staff at Black Hills. There’s AJ the ‘gearhead’, who supervises the production process, making sure all the machinery is running optimally. When AJ’s not at the plant, he’s tinkering with his hot rods. Then there’s JB, the loading machine operator, who arrives each day at the crack of dawn and can’t wait to get to his machine. And there’s Laverne, who, for 22 years, has been Black Hills’ ace ammo inspector. The video provides an insight into the human side of the production process. We think you’ll enjoy watching. 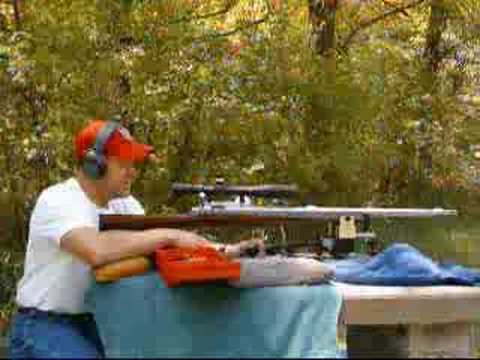 Share the post "The People Who Make Black Hills Ammo — Video Profile"
The 2010 Varmint Hunters Association Jamboree will be held July 26 – 30th, in Pierre, South Dakota. This 5-day event features a 2-Day Shootout, 3-Man Team Competition, and 3-Gun Match with prizes valued at over $4900. Classes for the Shootout are: Field Stock, Stock, Modified, Limited Open, and Unlimited Open. CLICK HERE for complete Shootout Rules. In conjunction with the Jamboree, the South Dakota state 600-yard IBS Benchrest match will be held on Friday, the 30th. During the course of the week, other fun matches will be held, including a 600-Yard Groundhog Shoot, a 100-Yard Youth Shoot, and a .22 LR rimfire fun shoot. The Jamboree is a family event with fun shoots Monday through Friday. There will be live and silent auctions, symposiums, special Ladies’ Events, regularly nightly speakers or entertainment, and a big Jamboree Banquet at the Ramkota Lodge on Friday. For more information, visit www.Varminthunter.org/jamboree.html, or call VHA members services, 1-800-528-4868. Advanced registration is $35.00, while registration during the Jamboree costs $40.00. A Shootout ticket alone is $25.00, while a Banquet ticket costs $25.00. You must be a member of the V.H.A. and registered for the Jamboree in order to compete in the Shootout. Share the post "VHA Jamboree Is Coming Soon — July 26 – 30, in South Dakota"
Sam Hall did it again. The 2008 IBS National Champion and 2008 Shooter of the Year captured his second straight National Championship, winning the 2-Gun Grand Agg shooting a standard 6BR in both Light Gun (LG) and Heavy Gun (HG) classes. It was an impressive victory in challenging conditions at the Varmint Hunter Assn. (VHA) range in Pierre, South Dakota. But this was a very close match. Mike Davis, runner-up in the Grand Agg, tied Sam in 2-Gun points, but Sam was awarded the title based on 2-Gun Small Group tie-breaker. Richard Schatz was just one point behind Sam and Mike. All three men shot superbly and any of the three could have won it all. Davis won the HG Overall Agg (with Hall second), while Schatz won the LG Overall Agg, with Hall again placing second. Both Davis and Schatz shot 6BR Improved cartridges in both LG and HG — Davis shooting the 30°-shoulder BRX, while Schatz campaigned a 40° Dasher. Rodney Wagner (6BRX) and John Griswold (6 Dasher) tied with 27 points in the 2-Gun overall, with Wagner earning 4th place overall on the tie-breaker. Complete Results are posted under Long Range Match Results on the IBS Website. A quick look at the equipment lists for both LG and HG classes showed the 6mm as the preferred caliber, with a 6mm Dasher or 6mm BRX the most popular cartridge (though Hall won it all with his standard 6BR). Despite the windy conditions, the mid-sized cases such as the 6-6.5×47 Lapua couldn’t outshoot their smaller brothers. Notably, Sam Hall used a plain vanilla 6BR to win LG Agg with a 2.852″. Shooting a 6BRX, Mike Davis won HG Agg with a 2.492″, with Hall’s 6BR only .054″ behind. Calibers: 17 of the top 20 in LG shot 6mms, mostly Dashers (but Hall won LG with a standard 6BR). There was one .22 and two 6.5s. In HG it was pretty much the same story, 16 of 20 using 6mms, with a couple 6.5s, a .308 Baer and a 30 BooBoo (not “39” as stated in equipment list). Barrels: Sam Hall won LG Group Agg with a Broughton button-rifled barrel, but otherwise cut-rifled barrels from Brux, Krieger, and Bartlein dominated the Top 20 in both classes. In HG, Mike Davis shot a Brux to finish #1. NOTE: Sam Hall had a Lilja barrel on his second-place, 28-lb Heavy Gun, not a Brux as shown on the official equipment list. Bullets: Sam Hall used Spencers in LG, and Steve Shelp shot BIBs in his 30 BooBoo Heavy Gun. Otherwise it was “all yellow box”, with Berger filling the Top 10 equipment rankings for both LG and HG. It’s fair to say Berger Bullets dominated the match. Powder/Primers: Alliant Reloder 15 and CCI 450s (usually pushing Berger 6mm bullets) composed the preferred combo in both LG and HG. Sam Hall did use CCI BR4s, however. Rodney Wagner was the only Dasher shooter to use Hodgdon Varget, but he finished fourth overall in the 2-Gun Aggregate. Optics: While ace shooters Sam Hall and Mike Davis both used Leupold Competition Scopes in both LG and HG classes, Nightforce scopes, (mostly 12-42 BR models) dominated the Equipment Top 20 lists. To our surprise, there were only a couple March Scopes in the Equipment Top 20 in HG, and just one in LG. Stocks: Shehane (D & B Supply) stocks were used by 8 of the Top 10-ranked LG Shooters, and 5 of the Top 10 in HG rankings. The Trackers, both ST 1000 and MBR Tracker, remain hard to beat. We did see some “true maxies” in this match. If you’re interested in 600-yard competition, or just want to shoot more accurately and consistently from the bench, you should watch a video Sam Hall put together last year. Because of wind noise, the audio is pretty bad at first, but be patient. Sam delivers some invaluable advice in the video. His tips on body positioning, gun-handling, and follow-through can earn you some points in your next match. Share the post "IBS 600-Yard Nationals in Pierre, SD — Hall, Davis, & Schatz Battle"
The Varmint Hunters Association Jamboree is set for later this month, July 27 – 31, in Pierre, South Dakota. This 5-day event features a 2-Day Shootout, 3-Man Team Competition, and 3-Gun Match with prizes valued at over $4900. Classes for the Shootout are: Stock, Modified, Limited Open, and Unlimited Open. CLICK HERE for complete Shootout Rules. Pre-registration costs $30.00, while registration during Jamboree cost $40.00. A Shootout ticket alone is $25.00, while a Banquet ticket costs $25.00. You must be a member of the V.H.A. and registered for the Jamboree in order to compete in the Shootout. Share the post "Mark Your Calendar for the VHA Varmint Jamboree"